Campaign Monitor is used by over 150,000 companies to create, send, and manage their email marketing campaigns. If you’re one of them, you no doubt need to see all your email marketing data together in one single dashboard, right? That’s where your new DashThis Campaign Monitor dashboards come in! Create your Campaign Monitor dashboards today! This list widget shows your mailing lists in order of total Member Count. This historic widget shows the percentage of how many people on the email list opened (or viewed) the email campaign. It is calculated by dividing the number of Unique Opens by the total emails received, and multiplying the result by 100. This historic widget shows the percentage of people who clicked a link in your email. It is calculated by dividing the number of clicks by the number of emails sent, and multiplying the result by 100. 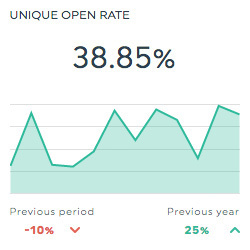 This list widget shows the top email campaigns according to their unique open rate. Want to see all our Campaign Monitor preset widgets? This shows the percentage of emails sent that were automatically returned by a recipient’s mail server. It is calculated by dividing the number of bounced emails by the total sent, and multiplying the result by 100. This shows the total number of emails sent for the particular campaign. This shows the total number of fans gained through your email campaign. This shows the total number of mentions that you received through your email campaign. This shows the percentage of people who received the email that opened or viewed the message. It is calculated by dividing the number of unique opens by the total emails received, and multiplying the result by 100. This shows the number of people who opted to unsubscribe to the mailing list they were previously subscribed to. This shows the number of people who clicked on one of your email’s call-to-actions. 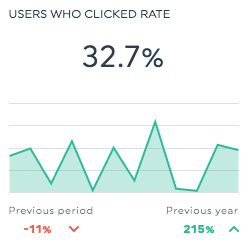 This shows the percentage of people who received your email and also clicked on one of your email’s call-to-actions. It is calculated by dividing the number of clicks by the number of unique opens, and multiplying the result by 100. This dimension allows you to isolate data according to particular campaigns. This dimension allows you to isolate data according to mailing lists. Want to see all our Campaign Monitor metrics, segments, & dimensions? How do I create a dashboard using Campaign Monitor?